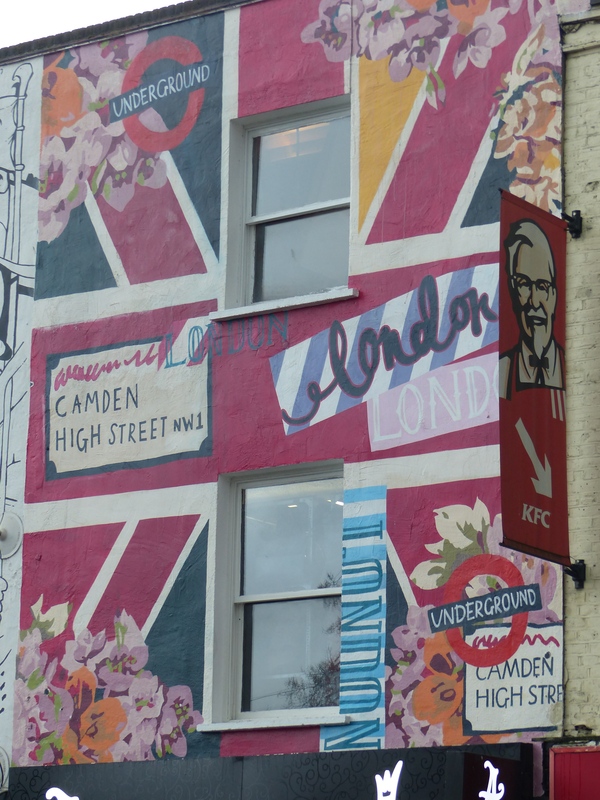 Lingering in London, Meandering Through Museums and Perambulating With Punks – Run. Ride. Roam. Today was a good day for ducks, but that rain made it a monster day for museums! It was a day to be indoors, so we returned for Part II of our discovery tour of the Victoria and Albert Museum. It seems we had the right plan. When we entered through our newly discovered underground entrance, we took a seat, to consult our museum map to check where we’d been and what we had left to see. “Can I help you? Can I direct you somewhere?” a very friendly and attentive member of museum staff asked us. The lady smiled, “That’s the way to do it,” she said. It sure is, in fact days and days could be spent in this amazing place. Still, days and days we did not have, so another day would have to do. 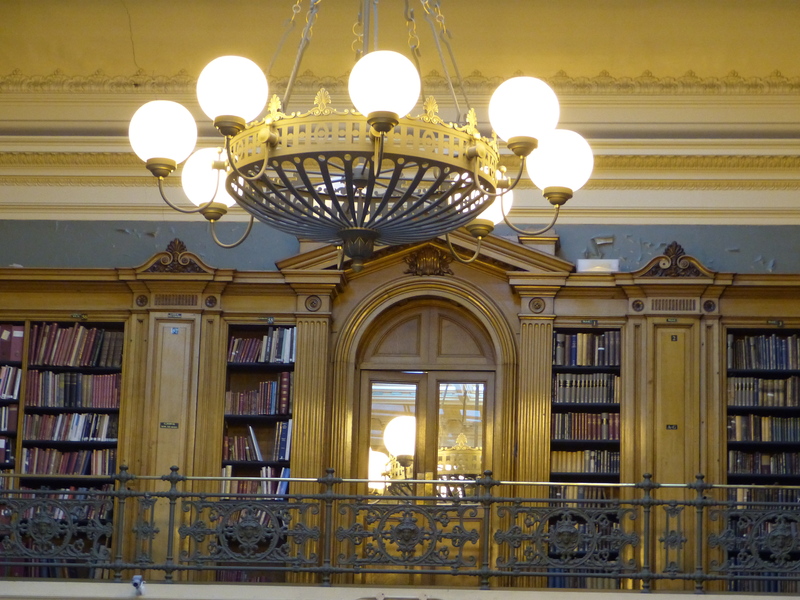 In the time we spent walking the halls and galleries of the V&A, we discovered exhibits that ranged from Constable paintings to Kylie Minogue’s dressing room and a hat worn by Dame Edna Everage! Here’s a selection of our viewings courtesy of Victoria and Albert. 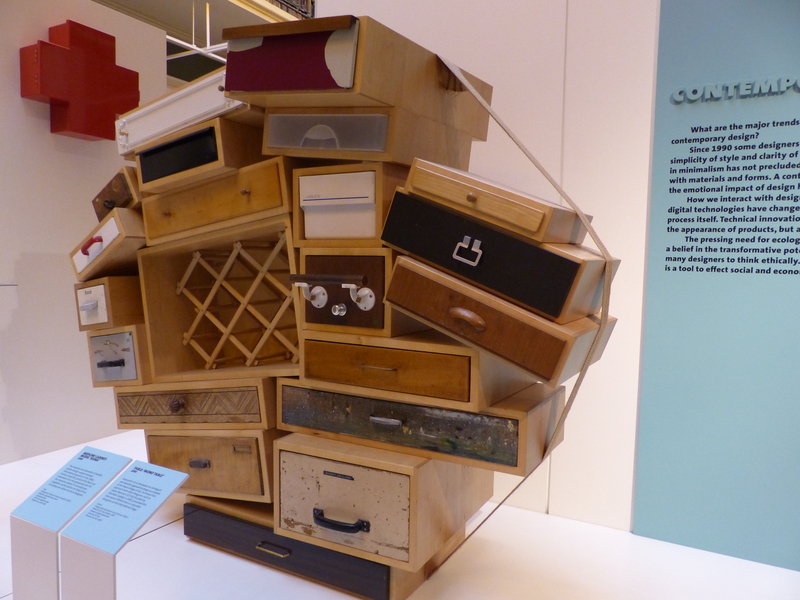 I loved this chest of drawers! Sometimes just the rooms themselves were spectacular, regardless of the exhibits. 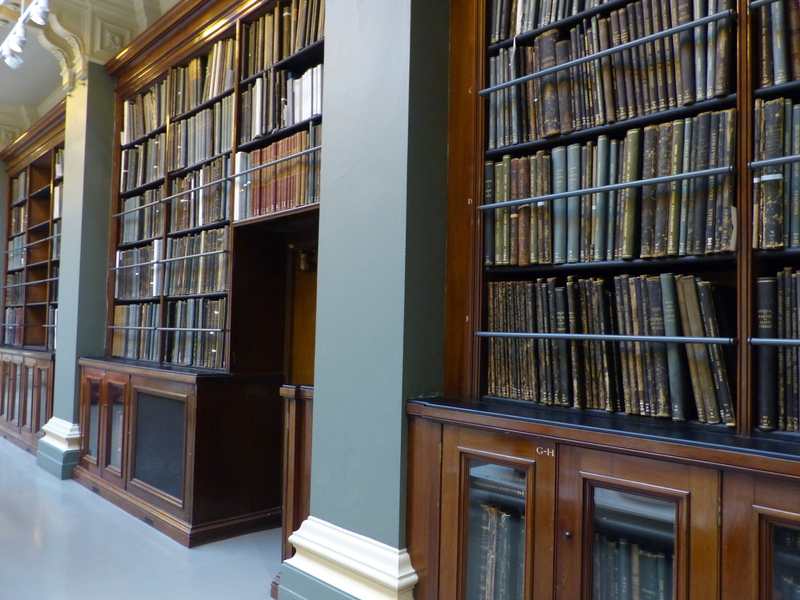 This one had wall to wall books and was a room I could live in! 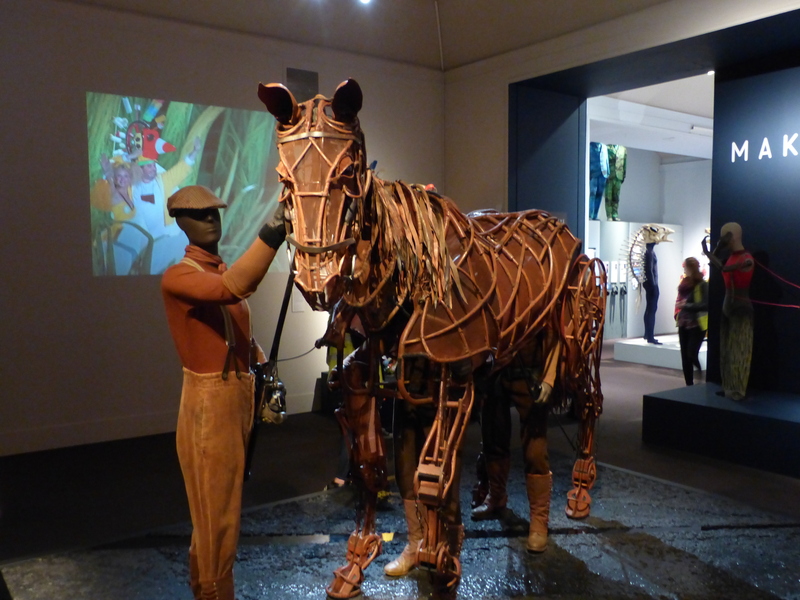 The “Joey” puppet from the play “War Horse”. We saw that in New York on Broadway and it’s one of my all time favourite productions. So cleverly done and just an amazing play that well and truly did the book justice. 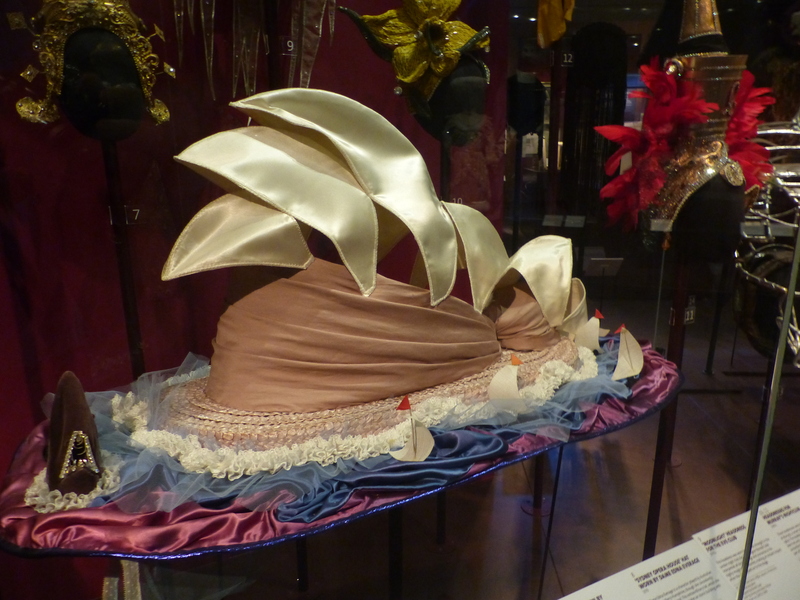 A hat worn by Dame Edna Everage. How classic! Kylie Minogue’s dressing room, as it was for her 2007 tour. Those clothes were so teeny tiny! Before leaving, we took a table in a discreet corner of the museum cafeteria, to have a purchased cuppa as a token gesture, while eating our contraband baggie BYO lunch. We sat in the beautiful and grand interior of that magnificent building, in the warm and dry, but do you know what…there were people sitting outside! You just have to love the British and their steadfast determination to stare down any weather full in the face and ignore it completely, no matter how inclement it is! We saw this on the chilly summer days, when people happily enjoyed their day at the seaside in 12C temperatures and wind, now here they were on a cold, raining, wintery day, sitting under the umbrellas of the outdoor tables, or sitting on the benches in the museum garden, with their brollies overhead and just having their alfresco lunch, no matter what the weather. Bless ‘em! You have to love that! 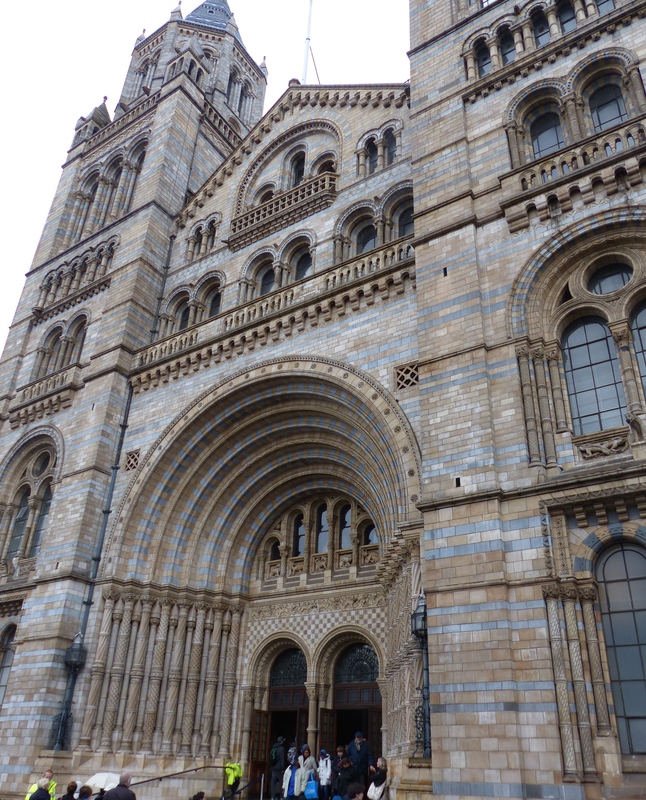 We weren’t quite as keen to stay out in the wet and cold, so after bidding Victoria and Albert a farewell and thanks for the fab visit, we strolled up the road to take a look in the Natural History Museum. 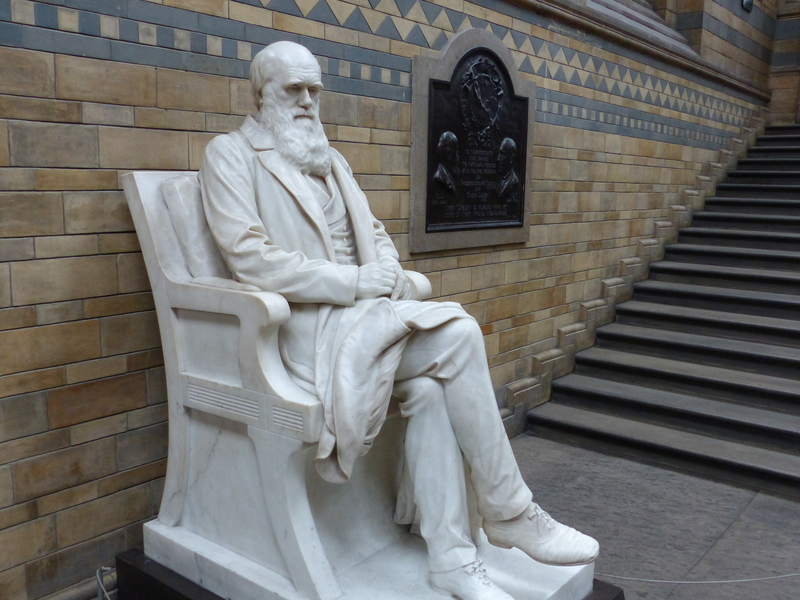 This was a place that had been on our list, ever since watching a documentary on a flight to the U.S. of all places, in which comedian Bill Bailey told the story of the unsung brains behind Darwin’s Theory of Evolution by Natural Selection. Alfred Russel Wallace was a contemporary of Charles Darwin and after travelling extensively and collecting hundreds of specimens of various species, developed his theory of natural selection. He wrote a detailed essay, explaining his theory and sent it to Darwin. Darwin had also formulated a similar theory and was horrified that Wallace would beat him to it and publish his theory first. So…as the documentary explained, Darwin used Wallace’s essay without permission and included some excerpts of Darwin’s own theory and presented it at a meeting of the Linnean Society, which then went on to publish Darwin’s theory, still containing Wallace’s work and still without Wallace’s permission. Long story short…the controversy is that Wallace apparently beat Darwin to the theory but Darwin got all the credit. 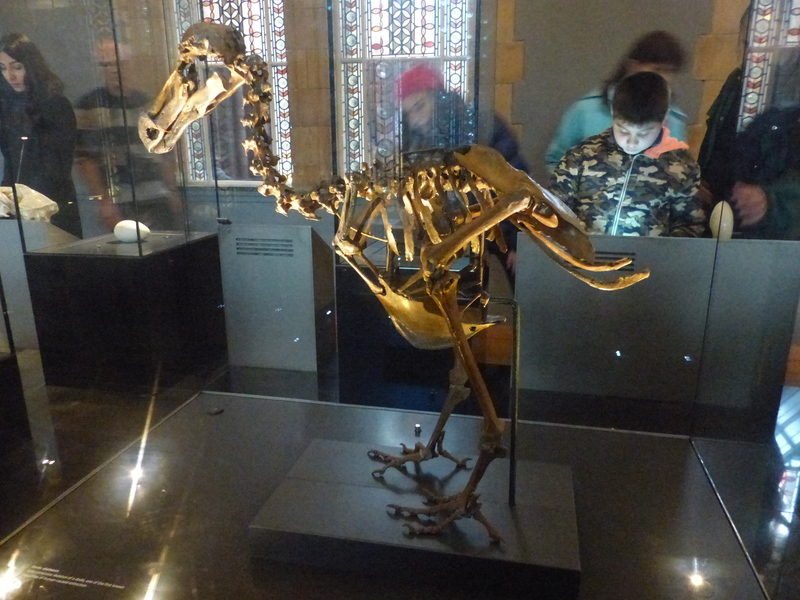 At the end of the documentary, Bill Bailey fought to have some recognition of Wallace’s work publicly acknowledged and as a result, a picture that had been kept in a storeroom at the museum for decades, was finally hung in the Natural History Museum. It was this we went to see. 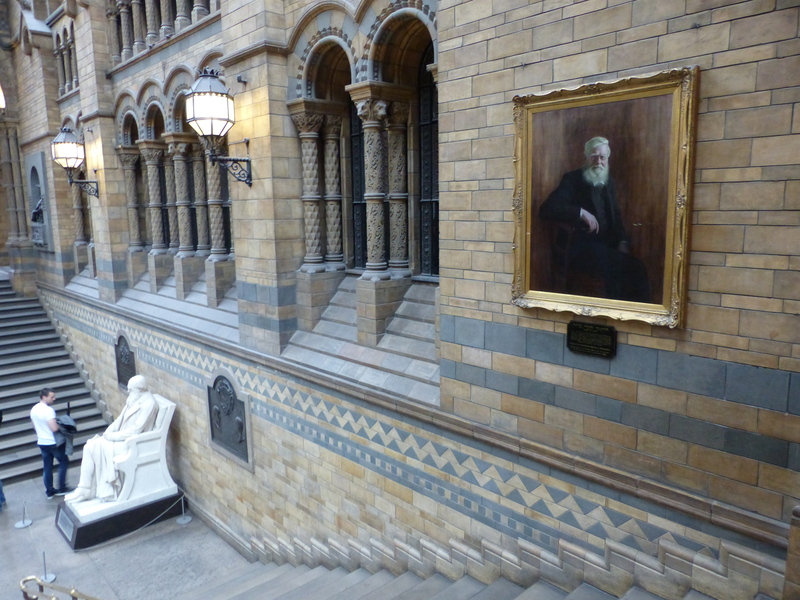 Darwin still has a huge marble statue front and centre, but just up the stairs, there it is, a small portrait of Alfred Wallace, presented to the museum in 1923, so it goes to show how long they had it without displaying it. Thanks to Bill, the co-author of Darwin’s famous theory has been given some recognition, albeit small in comparison to Darwin. 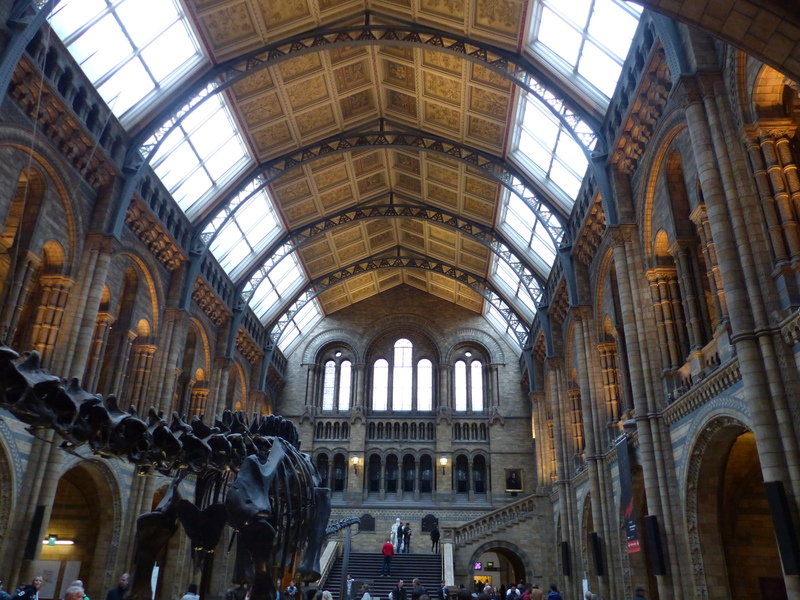 We continued to have a stroll around some of the exhibits and even the building itself was worth the visit. The exterior was grand and the interior was beautiful. When we left the museum, we walked past something that was quite special to see – the ice rink. 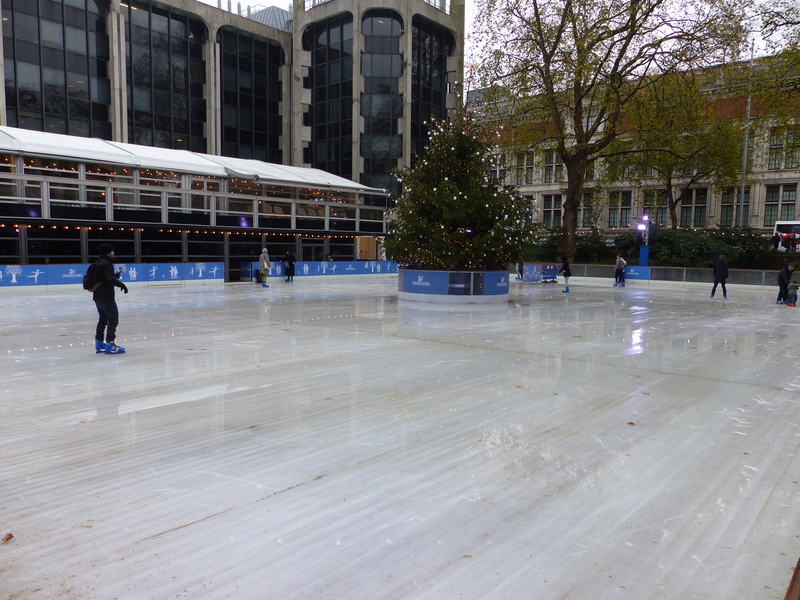 An ice rink had been built for winter, with a Christmas tree at its centre and people were skating and wobbling and laughing their way around the ice. It looked wonderful and would be a lovely sight lit up, with families enjoying the winter fun of skating in the city. A magic way to have fun in a London winter. Time to get outdoors, despite the weather. Come on Tassie travellers, toughen up! 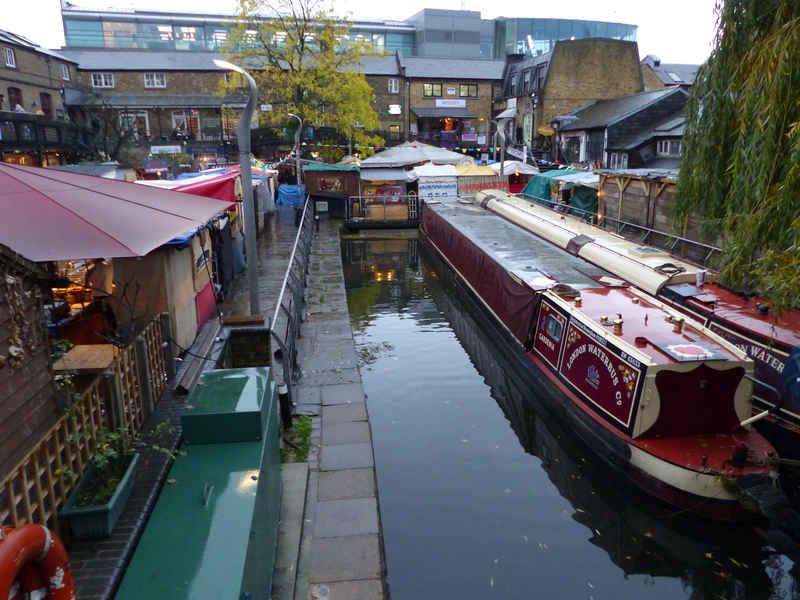 We hadn’t been to Camden Town, so decided to tube our way to this part of London. My, it wasn’t quite what I was expecting, but it was terrific anyway. I think I was expecting cobbled streets and something a bit olde worlde, but it sure wasn’t. This was the funky punky part of town! I wouldn’t have been surprised to see a Sid Vicious look-a-like walking down the street, because it had that kind of vibe – punk, very nonconservative, a bit left of centre, artsy and alternative. A very different vibe to the places we had been so far. 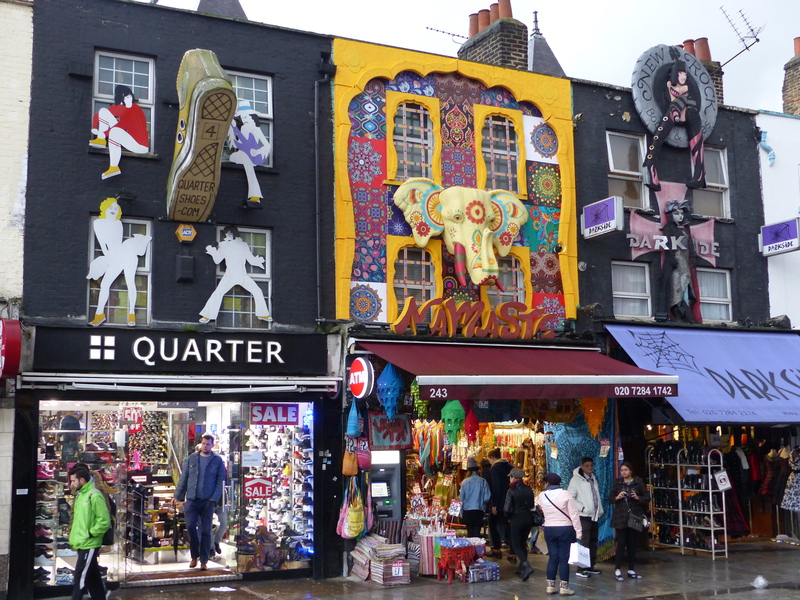 We roamed in the wet, with our brollies up and strolled through the many markets that pretty much make up the centre of Camden. The markets were amazing and had fantastic things on display. There were also a huge variety of food vendors, with a vast range of offerings. As we walked past one, he held out a piece of meat on a stick, offering me a taste. “Sorry, veggie!” I said, pointing to myself. Well, he retracted that meaty offering quicker than you could say “Cor blimey, it’s a lentil lovin’ looney” and seemed to have to take a moment to collect himself and regroup! I guess he was hoping for a meatatarian and got me instead. After a soggy, but super roam that gave us lots to take in, we set off to beat the oncoming darkness and make our way back to Canary Wharf. This required another ride on the tube and, for me, another safari through the Armpit Jungle. This is still the classic hazard of train travel for the vertically challenged such as myself. My face is at perfect armpit level to the average sized member of the travelling public, so there I was standing again, with a circle of male armpits around me, rocking around my face as we belted along the track in our tin can. I must say, it was a far more bearable experience to others I’ve had in the summer months! I don’t mind being short, but there are times when just a couple of extra inches would make life a little more pleasant at times! We’ve enjoyed our brief stopover in London and the weather hasn’t bothered us one bit, even though it has been cold and wet and windy. We expect that weather at this time of year, it was just when we had that through most of summer that it was a bit of a bummer. On we go, to explore further afield, experiencing the British winter and the special changes to the scenery and towns and villages it will bring. A chance to put on the jacket, the boots, the beanie and the gloves and join the locals in embracing the elements and experiencing the winter wonderland that England has to offer. New experiences and new adventures…what’s not to love!